Calton Hill, at the eastern end of Princes Street in Edinburgh, is surrounded on three sides by Regent Terrace, Calton Terrace and Royal Terrace, the last of these streets is pictured below. It was William Henry Playfair, the renowned Scottish architect, who was responsible for the building of these prestigious streets, with the Royal Terrace being completed between 1820 and 1830. 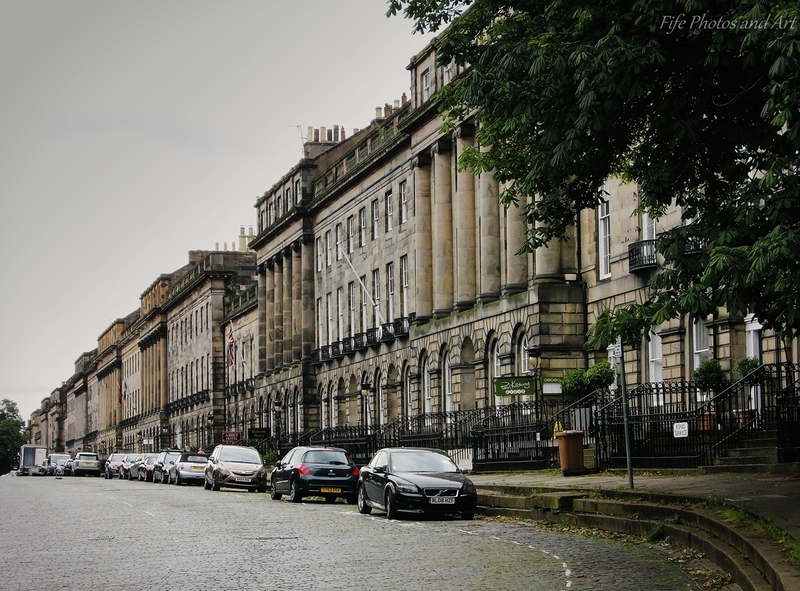 The Royal Terrace, which originally consisted of some very large townhouses (now mainly hotels), is the longest continuous stretch of Georgian architecture anywhere in Edinburgh. William Playfair had intended his Calton Hill development to extend a fair distance to the north of London Road, and to rival the Edinburgh New Town development by James Craig in the late 18th century (to the north of Princes Street), but unfortunately the work was never fully completed. The terrace has fine views over the Firth of Forth, and was known affectionately in the 19th century as ‘Whisky Row’. The reason for this, was probably due to the fact, that many of the residents of the Royal Terrace, were rich Spirit & Wine merchants, who could watch their ships returning from foreign trading trips. This entry was posted in Architecture, Fine Art Photography, History and tagged cityscape, Edinburgh, Firth of Forth, Scotland, Scottish history, urban photography. Bookmark the permalink. thank you! great shot 🙂 and now I know, where Whisky Row is and what it looks like! you’re welcome 🙂 Its kind of you, to spend your time, effort and creativity to share these with us! Loved this bit of history, and the pic of course – really captures the mood of Edinburgh on a grey day. Thanks, Andy! Yes! I was having to write about James Croll recently for the RSGS and for that I had to try and get my head around precession and axial tilt and their effects on the ice ages. All very well but I’m not a physicist! Need Brian Cox to explain it! Very grand, imagine the lifestyle of those who first lived there! Lovely shot. As Jo says, it really captures Edinburgh.